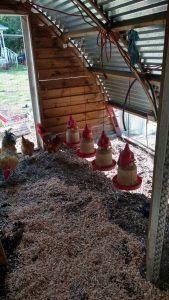 Our floor is dirt and we practice deep litter composting so when the gang has scratched the bedding through the dirt, I’ll add more bedding and more bedding and ten reap the benefits in the Fall. We have 26 chickens in this coop so the bedding gets tossed rather quick! I recently started using America’s Choice Eco Flake bedding on the floor and in the girls boxes; it seems to be the only thing they don’t immediately scratch OUT of their boxes, yay! I used to use straw on the ground but, since we practice the deep litter method, the flakes take a little less time to break down and they seem to be more popular among those who matter. Also, straw was immediately kicked to the ground by my stubborn hens the moment I filled their boxes, so I decided to stop wasting my money. Another perk of the eco pine bedding is that, since it’s smaller, it goes further and smells delightful. I’ve also noticed a decrease in flies. We live in West Central Florida so it gets rather hot in the summer and flies can be quite the nuisance. I hang their waters so they can’t perch (and poop) on them; it also aids in keeping whatever ground they’re scratching out of the water trough. Feeding time takes place outside of the coop where they have two lots: 25 ft x 75 ft each. We just started rotating the two lots so we’re hoping to regenerate growth in what is now their “2nd lot” and what used to be their main, and only, lot. 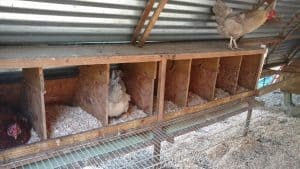 We didn’t build this hen-house but I have made modifications since we moved onto our homestead as there were certain features that just didn’t work for us. 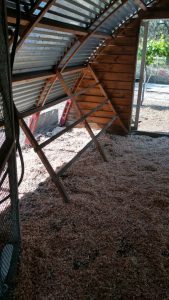 What does your hen-house look like? Do you have a favorite feature that you’d like to share? We’d love to hear about it! 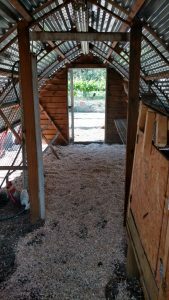 View more pictures from The Green Acre Homestead HERE or read about “What Does a Henhouse Need?“!